This storage cocktail table features a wood veneer top and two drawers with nailhead trim and serpentine brass drawer handles. The drawers can be used for storing coasters, reading materials, media player remotes, and miscellaneous items. Note the beautifully reeded case corners, hand carved detailing, and turned arrow feet. This is a beautiful cocktail table and a fantastic centerpiece for your living room that will bring you satisfaction for years to come. 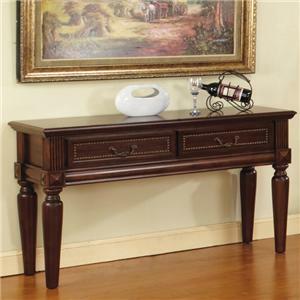 The Davina 2 Drawer Traditional Cocktail Table with Nailhead Trim and Turned Feet at Morris Home in the Dayton, Cincinnati, Columbus, Ohio, Northern Kentucky area. Product availability may vary. Contact us for the most current availability on this product. 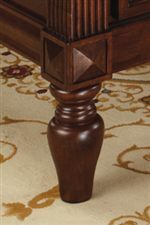 The Davina Traditional Occasional Table Collection includes a cocktail table, sofa table, and end table, all of which are ornately decorated with crown molded case tops, reeding, turned arrow feet, hand carved details, nailhead trim, and serpentine brass drawer pulls. The rich mahogany appearance rendered by the deep red wood finish of the collection adds to the traditional appeal of these pieces. 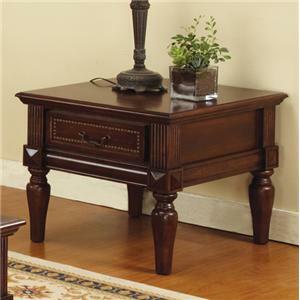 Use the occasional tables to add accent and intrigue to your traditionally styled home. The Davina collection is a great option if you are looking for Traditional furniture in the Dayton, Cincinnati, Columbus, Ohio, Northern Kentucky area. Browse other items in the Davina collection from Morris Home in the Dayton, Cincinnati, Columbus, Ohio, Northern Kentucky area.